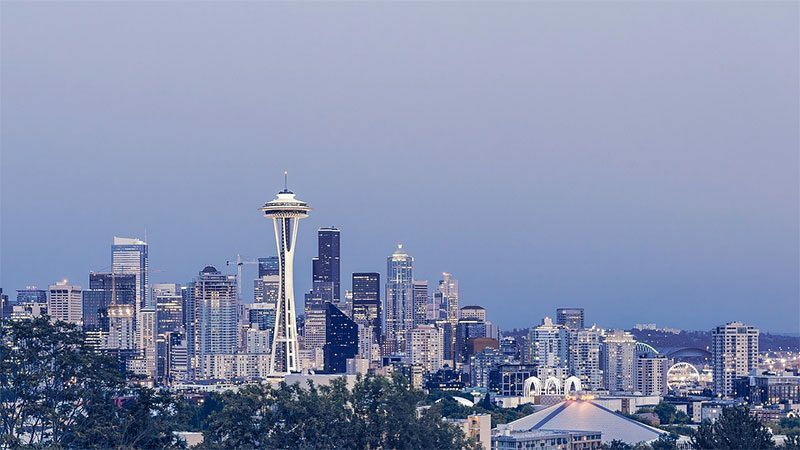 The city of Seattle, considered the economic and cultural hub of Washington State and the entire Pacific Northwest, is more than a little famous for the beverage known as coffee—you may have heard of a little place called Starbucks that originated here. However, despite their enormous sales, Starbucks and the other superstars of the Java world, which have now branched out throughout the country and around the globe, are no longer considered the top of the heap in this very discerning city. Instead, a number of other smaller craft coffee outlets have spread throughout Seattle like a tasty plague, bringing with them some local patrons with astute palates and a lot of dollars. In the following article we will highlight some of the “new and improved” coffee establishments in the city and point out some of the beverages and characteristics that have made them so popular in many Seattle neighborhoods. The La Marzoco Café and Showroom, located in Seattle Center at 472 1st Avenue North, is a special coffee house in that it serves as a platform for showcasing the wide breadth and diversity of specialty coffees for a new generation. What makes La Marzoco so unique is its rotating lineup of partners and roasters in residence. Each month, a new coffee partner has the great opportunity to refashion the café in their own vision, making every visit to La Marzoco a new and special experience. Some of the roasters/partners that have had—and will have—the opportunity to reshape the café and menu include the American “Stumptown Coffee Roasters,” “G and B Coffee,” from Mexico City; “Campos Coffee,” from Sydney, Australia; “Coffee Supreme,” from Wellington New Zealand; and many, many more. In addition to serving up great cups of coffee, La Marzoco additionally serves as a learning destination for coffee enthusiasts. Their custom Espresso Lab invites guests to work hands on with their team of professionals as they learn how to make coffee from start to finish. The café always has new styles and brews for customers to purchase and enjoy, and it even hosts several coffee tasting events throughout the year. In a city known for its great coffee, La Marzoco Café and Showroom is a wonderful destination at which to fritter away a morning while drinking supreme coffee blends and perhaps even learning more about how coffee is made. With two locations in the city, including one on 310 East Pike Street in Seattle, Victrola Coffee is one of the most oft-visited coffee houses in the city. Victrola Coffee is very popular for their simple, yet comfortable décor and seating and for their plain shot of espresso that can only be described as “first-rate.” Also a crowd favorite is their espresso con panna, a shot of espresso with a small dollop of frothy whipped cream on top. At Victrola, the whipped cream is made from scratch and is infused with vanilla bean, so it is especially yummy. Victrola Coffee offers a full line of regular and flavored hot coffee beverages, as well as a delectable assortment of iced coffee beverages, teas (from around the world), juices, and tasty snacks that go great with your morning java. Located in the Fremont suburb of Seattle, Milstead and Company was once labeled by Food and Wine magazine as the “snobbiest coffee house in the country.” However, it was also chosen as one of the finest coffee shops in America; so apparently their “snobbiness,” which translates to caring deeply about the types of beans they use in their coffee-making process, has paid off in terms of excellence. Along with a few other coffee shops throughout Seattle, Milstead and Company has developed a new model for serving up some of the best coffee in the world—one that combines great-tasting beans from near and far and an artistic approach. Located just west of Troll Avenue, Milstead and Company features long, tall tables that are always bustling with customers and an entryway in which coffee bags and brewing equipment are neatly arranged in a large wooden display case. The guests at Milstead and Company tend toward the Generation-X age range, young students tapping away on laptops inside the exquisitely-decorated building. A few brave souls, battling the morning chill, can usually be found sitting outside in the garden, a mixture of local foliage that must be seen to fully appreciate. Milstead and Company draws locals and coffee-loving tourists from around the world, from Liverpool to San Francisco. All of these Java lovers come to sample the café’s amazing new coffee blends and to seemingly become immersed in this new and much improved coffee culture, where great coffee and beautiful art are beautifully combined. An enormously popular café, which is located in the Greenwood section of Seattle, Washington, Preserve and Gather is the perfect destination on a beautiful sunny day to enjoy a cup of carefully brewed coffee with a lasting flare. The coffee house boasts a very stylish interior design with art from local artists displayed on the walls. Inside, guests will find not only a delicious cup of steaming java to warm their bones and spirits, but also a variety of tasty snacks, particularly their homemade yogurt and fantastic apricot compote. Unlike most modern coffee houses, Preserve and Gather does not feature Wi-Fi in its buildings or on the grounds. The reason for this is fairly simple: the owners wanted to create an electronic-free space that inspired friendly conversation as well as tremendous coffee. This business model seems to be working for them, as the place is usually packed with couples and groups discussing the issues of today. When it comes to their coffee, Preserve and Gather features a diverse and wide selection of local and imported beans, a comprehensive station of decadent creams and syrups and tasty iced drinks that are ideal on a hot sunny day when you need that afternoon jolt of caffeine.